The SmartSeries 5000 brush featured in this comparison has been replaced by a new upgraded model. The new version of this brush is the Oral-B Smart 5 5000 (view on Amazon). 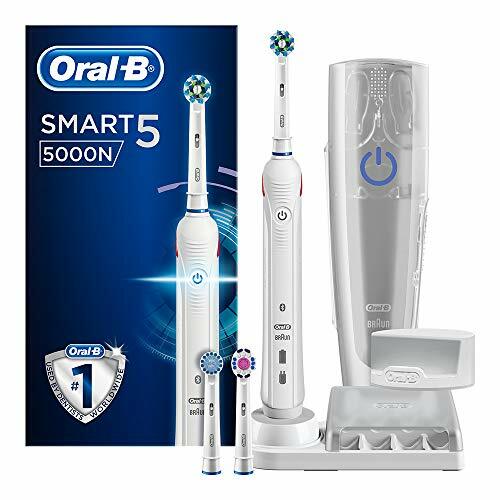 You can find out more about it and what we think of it by viewing our Oral-B Smart 5 5000 review. Two of the more premium models available, the primary differences are the battery life and travel case. Whilst the Pro 7000 is the ‘better’ brush, there comes a point where the cost vs return becomes difficult to justify. This is the vase when comparing the 7000 to the 5000. The 7000 is better suited to a traveller with advanced requirements. For the vast majority, the SmartSeries 5000 will serve you perfectly well with multiple cleaning modes, slim body, rigid construction and the included accessories. That being said, we’d also recommend considering some of the newer brushes included in our roundup here. The Pro 7000 has 10 days of battery life compared to the 7 of the SmartSeries 5000. The 7000 comes supplied with a premium travel case compared to the basic travel case of the SmartSeries 5000. The 7000 comes with an extra travel pouch/bag that the 5000 does not. The 7000 comes with 5 brush heads included (2 x CrossAction, 1 x FlossAction, 1 x 3D White and 1 x Sensitive) compared to the 3 supplied with the 5000 (1 x CrossAction, 1 x 3D White and 1 x Sensitive). The SmartSeries 5000 comes with a smartphone stand. The Pro 7000 is Black in colour compared to the Blue of the 5000. The 5000 is the cheaper of the two brushes. The 5000 model is somewhat confusing as over the years there have been different variations of this model, each with small differences, be that box contents or its name. For the sake of keeping things simple and short, the following table highlights how the models differ. It is the SmartSeries 5000 (2016 Edition) that I speak about here as I compare to the Pro 7000. Detailed Comparison: What’s the difference between the Oral-B SmartSeries 5000 and Pro 7000? What set’s these two brushes apart is in all reality a few very minor things. However, depending on your circumstances will depend on whether these differences are important. There are in fact 9 distinguishable differences, which are noted in the bullet points above, but I shall now discuss each difference in a little more detail. Starting with the cleaning modes. The Pro 7000 has 5 cleaning modes (Daily Clean, Gum Care, Sensitive, Whitening and Deep Clean) compared to the 4 modes available with the 5000 (Daily Clean, Gum Care, Sensitive and Whitening). The additional deep clean mode found on the Pro 7000 is a mode that lasts longer for as the name implies a deeper clean. This is not necessarily designed to be used everyday, but might be used once a week to give that extra bit of attention to the teeth. There is too a small difference in the way that these modes are accessed on the brush. With the 5000 you press the power button to cycle through the different modes, whilst the 7000 has a button separate from the power, that should be pressed to cycle through the modes. The slimmer SmartSeries 5000 has an internal battery, not a user replaceable one like the Pr 7000 but the difference between the two is that the 5000 will offer 7 days of battery life compared to the 10 of the 7000. To gain the extra 3 days battery life the profile of the 7000 is thicker, larger and heavier than the 5000. 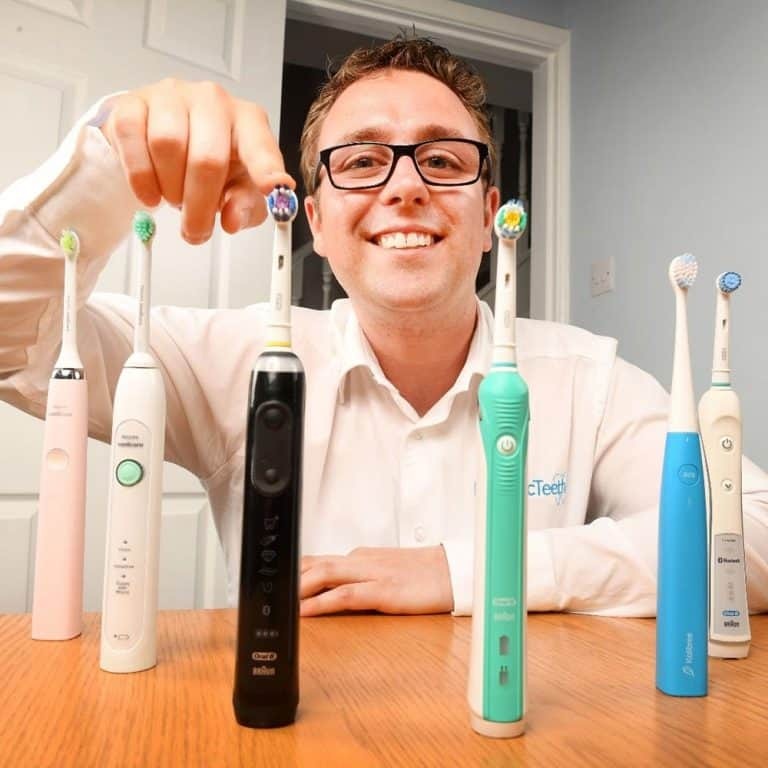 So whilst the 5000 may offer only 28 minutes of brushing time compared to the 40 of the 7000 the bulkier in hand experience might not be for everyone. However, it does mean going for longer between charges. Good for travelling. Both come with a travel case and ultimately both will protect either toothbrush and up to 2 brush heads when inside. Both are of plastic construction, but it is the Pro 7000 that boasts the most premium finish. Rather than a cheap yet effective moulded plastic case that comes with the 5000, the thinner opaque case is replaced with a much more robust construction that is finished on the outside with a soft touch black material. Inside rather than basic and functional clipping points, the case for the 7000 has a lovely moulded design which is more pleasing to the eye and smooth to the touch. The downside to this is that the 7000’s case is slightly larger and heavier but it feels and looks the better product both from a visual and impact resistant point of view. Regular travellers, business users in mind, may feel the 7000’s case is the better option. Whilst if you travel fairly infrequently, with maybe a couple of holidays a year, then the 5000’s case is perfectly fine. A small, but not necessarily required extra that comes with the 7000 and not the 5000 is a travel pouch/bag. This is an extra accessory that could be useful for storing the charging stand and smartphone holder in. As the Pro 7000 does not charge in the case, if you are travelling for extended periods you will need to take the charger, this pouch acts as a travel bag for that. Oral-B’s range of brush heads extends to 6 different options. Few of us will ever need or want all 6, but some are better suited to different cleaning modes found on the brushes. The 7000, comes with 5 brush heads included. These are 2 x CrossAction, 1 x FlossAction, 1 x 3D White and 1 x Sensitive. Compared to the 3 supplied with the SmartSeries 5000 which is supplied with 1 x CrossAction, 1 x 3D White and 1 x Sensitive head. If you would like to know more about each brush head and how it best integrates with the different cleaning modes, read our ultimate guide to Oral-B brush heads that explains the differences. In some respect the inclusion of additional heads with the 7000 is a waste if they are not to be used, but the inclusion allows you to try them and find out how they work and if they work well for you. Oral-B would suggest advantage by using the appropriate brush head with the appropriate cleaning mode. Although the 5000 does not come with as many heads, you can purchase any of the 6 different brush head styles available as accessories for the brush. Whilst similarities between these two models will be discussed at length shortly one feature they both share is Bluetooth connectivity, whereby the brush can pair to the phone via an app. Using this app you can monitor your cleaning progress live, with helpful prompts and tips. The problem is you really need your phone for this. With the Pro 7000, you need to hold your phone or leave it on a countertop in view. With the Pro 5000 you have a stand included that will hold the smartphone at an ideal viewing angle in portrait or landscape orientation. A small but useful accessory that allows you to see what is happening on the phone screen, but also keeping your phone away from water and off bathroom surfaces. If you are to make best use of the app, then this stand goes some considerable way to helping with that. Believe it or not, I believe this stand is a ‘better’ solution than the complicated suction cup clamp arm solution supplied with the Genius range, but this is required to take advantage of the advanced features it offers. As you might expect the 7000 does have another trick in the box and this comes in the form of the Wireless Smart Guide. It is a little oval shaped object that is powered by 2 x AA batteries. It looks like a small clock and acts as this when not in use. This connects to the Pro 7000 when it has been switched on. A small but perhaps important difference is the colour. The 5000 sports a gloss which plastic body with raised plastic grips on the rear of the handle, but the front is flanked with a soft touch Royal Blue rubber strip that runs top to bottom. The 7000 on the other hand has a matte black rubber finish to the vast majority of the brush with 2 silver panels that are a it glossier to the touch on the right and left hand side. The rear rubber grip is etched with grooves to help with grip. So then to the final difference which is the price. Prices are always changing, but at the time of writing, the 5000 is the cheaper, with the 7000 commanding a premium of £50. When the 5000 is already around the £80 mark, a further £50 is not to be sniffed at and diminishing returns are what you get for the extra spend. As I can see it the 5000 represents the better value option, even if the 7000 does offer a bit more in the box. Even then, if you are looking at the 7000 or decide it is the one for you, there are other similar brushes at this price point that might be worth considering, namely the Genius 9000. That is then the key differences between these two models. Similarities do exist though and I shall quickly run through some of these to ensure your familiarity. Both use the same charging stand and come supplied with one in the box. This stand sits on a countertop and connects to a 2 pin socket found in most bathrooms. If you do not have a socket in your bathroom, you will need to purchase an adapter to use it with the 3 pin mains here in the UK. Learn about why this is here. Both come with a brush head storage compartment, that has a lid to protect up to 4 brush heads, when not in use. This same moulded plastic tray has a cutout into which the charging stand can fit, to give a neat countertop installation. The 7000 offers one extra cleaning mode, deep clean, but this is not justification that it cleans better than the SmartSeries 5000. Both brushes have delivered to the brush head, the same power and generate the same number of oscillations and vibrations. There is no difference in the clean between either of these brushes. Yes, the SmartSeries 5000 is the cheaper at around £50 less. Whether the extra spend is worth it will depend on your desires. The extra battery life and travel case particularly command some extra value. However, the benefits gained for the extra spend are in my opinion limited. Apportion this over the usual life of a toothbrush of 3+ years and the difference is negligible really, but it is a difference nonetheless. The SmartSeries 5000 is my recommendation and winner in this head to head when taking everything into consideration. Yes the 7000 has a place and is by no means a bad brush, but the price is restricting given the added extras. The 5000 offers way more than the essentials and more than equivalently priced products from other brands. If something compels you to the 7000, to look at the Genius 9000 as an alternative. The 5000 is a solid all round package that works well for an individual or in a family environment. A balance of price, portability and function come together nicely.